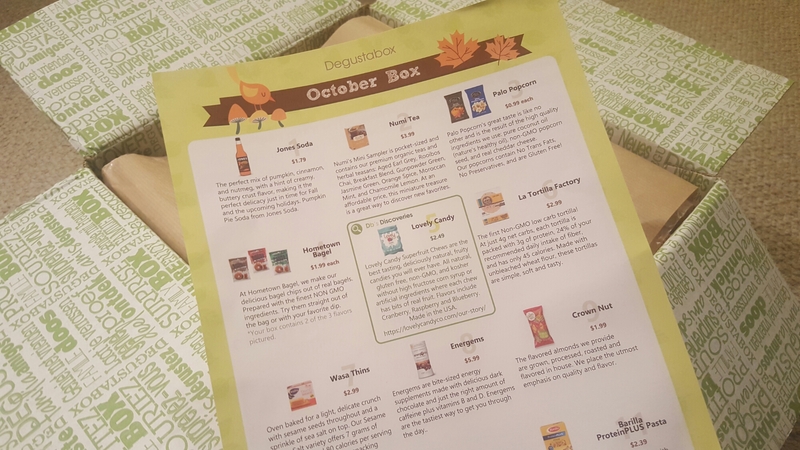 Degustabox, one of my favorite foodie subscription boxes, is a monthly subscription box that brings your favorite food and snacks right to your doorstep. The subscription costs only $19.99 per month and you’ll get a box filled with 10-15 products and goodies including sauces, drinks, chips, candies and more! 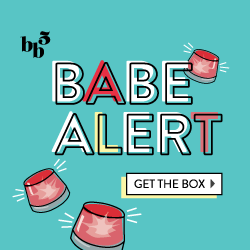 The October box was definitely a goodie, filled with some brands and products I already know (and use), as well as some new ones. 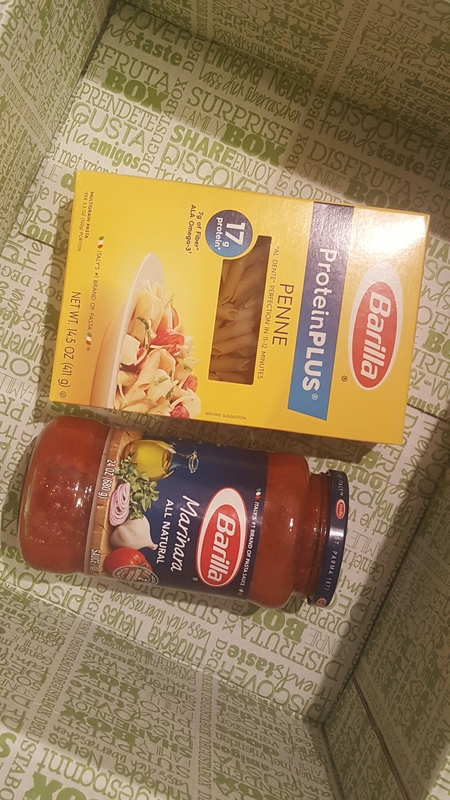 They must have had a partnership with Barilla, because this box included Barilla Marinara Sauce and Barilla Protein Plus Pasta. While I usually make my own red sauce, this is great for one of those busy nights when you’re working late, still have to go to the gym or do laundry and want to get a nutritious, filling meal in too. I used both ingredients lately, along with sautéed vegetables and turkey meatballs to make a complete, delicious meal! I used to eat Wasa Thins all the time! These Sesame & Sea Salt crispy crackers are simple and can be paired up with a variety of items; I prefer to stack them with cheese or enjoy with a hearty dip. 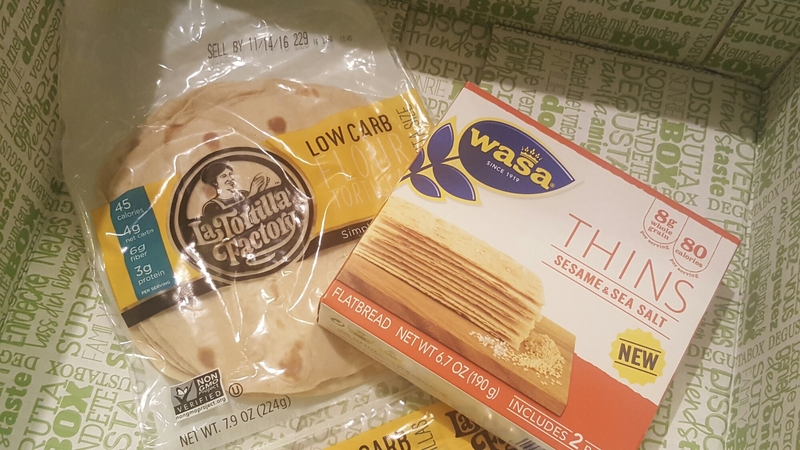 I already eat and love La Tortilla Factory Low Carb Flour Tortillas, so this was a perfect item in my box! They’re perfect for making tacos, a lunch wrap, and even baking/flying to make low carb tortilla chips. Hometown Bagel Chips in Cinnamon Raisin and Garlic were clear winners of this box. Seriously, these may have been my favorite items! They are delicious to snack on as is, pair with cream cheese and peanut butter (for cinnamon raisin chips) or hummus and savory dips (garlic chips). Recommend! 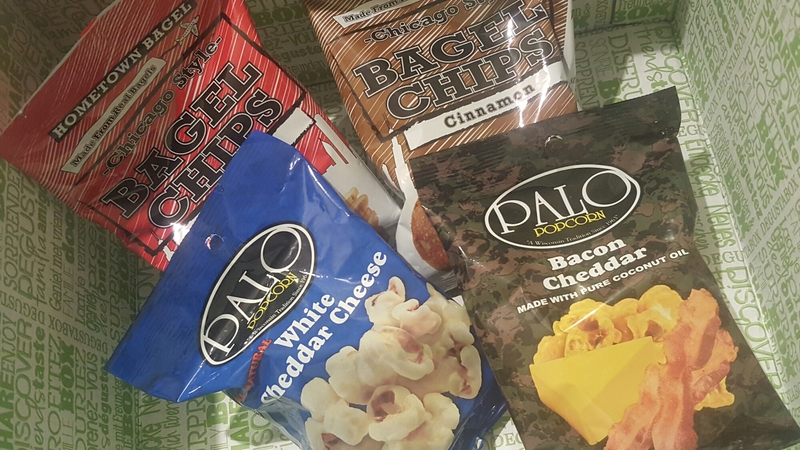 Palo Popcorn individual bags came in two different flavors, Bacon Cheddar and White Cheddar Cheese. While the bacon cheddar were a bit too extreme for me, I enjoyed the white cheddar popcorn! It was a great pick-me-up at work. Jones Pumpkin Pie Soda is definitely quite the twist on the pumpkin spice craze. This also was not one of my favorites, but was definitely interesting to try out! If you’re a pumpkin fanatic, you’d like this one. These vegan, non-GMO, and gluten-free Lovely Candy Co Superfruit Chews in Berry are so delicious, you wouldn’t realize they’re better for you than your usual gummies. I’m a gummy fiend, so these were consumed within an hour of unpacking and photographing this box! I’ve actually consumed Energems Chocolate Energy before; these delicious little buggers are packed with the same caffeine as a cup of coffee, so they’re perfect for on-the-go or a quick pick-me-up. Personally, I use them to pep up during the afternoon work slump or about a half hour before a workout. This cute little bag of Crown Nut Co Sriracha Almonds were snatched up by K pretty quickly. We both love sriracha, almonds and healthy snacking, so we’d definitely purchase in the future. Finally, we have a Numi Organic Tea Mini Sampler. This simple, classic assortment is perfect as it has some caffeinated teas, some low/caffeine-free teas and and a variety of flavors to fit any mood. All in all, this was a pretty good Degustabox! I knew a lot of the brands and tried some new ones as well. My favorite items were definitely the Hometown Bagel Chips, and I recommend you run out and purchase some asap! Have you tried DegustaBox? Save 50% on your first box with coupon code DEGUSTA10.